'You are to model 3 troops of dragoons, each troop to consist of 50 men and the Lord Cardross to be Colonel and Captain of one troop, Robert Jackson to be Lieut-Colonel and Captain of the 2nd, and Patrick Hume of Polwarth to be Captain of the 3rd, and John Guthrie to be Major without any troop. You are to appoint lieutenants and other inferior officers for the said troop of dragoons. Throughout the year of 1690 these dragoons were employed in William III's fight against Jacobite supporters north of the border. They were called Cardross's Dragoons at this time. Richard Cunningham had been put in command of the infantry regiment, also raised in Dec 1689, but on 30th Dec 1690 he was placed in command of the combined Horse and dragoons which now consisted of 6 Troops, 50 men per Troop. The regiment were on the Scottish Establishment and remained in Scotland until February 1694 when they were ordered to march south and embark for Flanders. When they reached Berwick they were placed on the English Establishment and continued south until they embarked at Greenwich on 21st May. Before embarkation the regiment had been augmented by the addition of 2 more Troops and 10 more men added to the strength of each Troop. There were now 8 Troops of 60 men each. The regiment arrived at Willemstad on 31st May 1694 and were quartered at Aerschot and inspected by William III on 16th June. They were brigade with Eppinger's, Essex's (4th) and Wynne's (5th) Dragoons under Brigadier Wynne. They were moved around and encamped in many places such as Mont St Andre, the Chateau of Sombref and Nivelle. Although the French were confronted on a few occasions battle did not take place in that year, but the town of Huy was captured. They wintered near Ghent and did not become active until May 1695 when King William arrived back in Holland. The King reviewed Cunningham's Dragoons at Arseele on 31st May and found them in 'an extraordinary good condition'. A force of 400 French were known to have occupied the town of Moorsleede. They were under orders to capture the bread wagons heading for William's Army. Brigadier Wynne's brigade of 500 dragoons were ordered to drive the French out. The streets were barricaded and attacked by the dismounted dragoons without too much trouble. There were casualties, including Brigadier Wynne who was shot in the knee and unexpectedly died a few days later. His place as brigade commander was later taken by Colonel Cunningham. William laid siege to the city of Namur from 2nd July and directed the Prince of Vaudemont to employ his army of 36,000 in covering the siege and deflecting the approaching French army under Marshal Villeroy. Cunningham's Dragoons were part of this force and had to help prepare fortifications between Arseele and Wacken. As the French positioned themselves to confront the British it became clear that their defensive position was untenable and the Prince cleverly withdrew his army without actually appearing to do so. The dragoons were in the rearguard of the withdrawal and managed to fight off pursuing cavalry. Thus the Prince of Vaudemont saved his army which made its way to Ghent. The regiment became part of Lt-General Bellasis's force covering Nieuport until Namur capitulated on 1st Sep. They were then moved to Brussels which was being bombarded by the French. This was a diversionary tactic by Villeroy to draw the besieging forces away from Namur but it caused great suffering to the civilian population. Later the dragoons encamped on the Bruges Canal and in October went into winter quarters in the Pays du Nord. Very little happened in 1696; the armies faced each other without fighting. In May 1697 King William arrived back from England to join his army and inspected the mounted troops. It was reported that Cunningham's 'made a very good appearance, both man and horse being in very good order.' At the end of August they were moved into position for an expected battle against Villeroy. This position extended from the Chateau of Coudekenken to St Michael to defend the plain that was the route of the French army to Bruges. However, in early September a peace was concluded and hostilities ceased. The grateful burghers of Bruges rewarded Vaudemont's army with 400 barrels of beer for protecting their city. The regiment did not fight in the War of the Spanish Succession. During that period they were quartered in Scotland, but in 1711 the regiment, now called Kerr's Dragoons (again), were sent to the Low Countries. They did not take part in the siege of Bouchain in Aug/Sep of that year, neither did they go into action the following year. In February 1713 the Treaty of Utrecht was signed and the war was over. 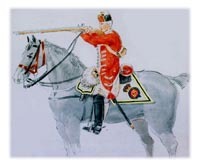 Kerr's Dragoons received orders to return home in the summer of 1713. They marched to Dunkirk and were ordered to hand over their horses to the Royal Dragoons. They were then to be sent to Ireland to serve as a dismounted regiment. They remained embodied until the spring of 1714 when they were disbanded, on a date that is not known. The reasons for disbandment were threefold: Firstly there was a popularly held rooted objection to a standing army. Secondly it was a measure of economy. And thirdly, Jacobite influence was strong at this time and regiments that were predominantly Protestant were targeted. The redundant soldiers were absorbed into two other dragoon regiments, the Royal Dragoons and the 2nd (Scots Greys) Dragoons. The officers were placed on half pay. When George I arrived in England from Hanover on 17th Sept 1714 it was immediately recognised that the army should be rebuilt. The men who had been taken on in the two regiments of Dragoons were recalled to serve under their former Colonel, The Hon William Kerr. The order to re-embody Kerr's Dragoons came in a letter from the King dated 3rd Feb 1715. Colonel Kerr's new commission actually dates from 31st Jan 1715. He had 20 officers plus a chaplain and a surgeon. There were six Troops of dragoons, 2 from the Royals, 3 from the Scots Greys and one raised from scratch. 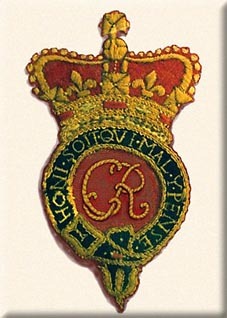 From 1690 to 1715 the regiment had been named after its four Colonels. The current Colonel, William Kerr (or Ker) took over in 1709. It should be mentioned that this William Kerr (2nd son of the Earl of Roxburghe) is not to be confused with the previous William Kerr who was the second Colonel of the regiment. That man had three titles: 2nd Marquess of Lothian, Lord Newbattle and 4th Lord Jedburgh. In 1715 the regiment received official notification that it's title was to be 'Her Royal Highness the Princess of Wales's Own Royal Regiment of Dragoons'. The letter was dated 1st August 1715 and signed Wm Pulteney, Secretary at War. The Princess Wilhelmina Carolina was married to George the future George II. When George I died in June 1727 the Prince of Wales became King George II and the title changed to 'The Queen's Own Regiment of Dragoons'. In 1715 the Princess of Wales's Own Dragoons were dispersed around Yorkshire and co Durham. The day after receiving notification of their Royal title, they were commanded to hold themselves 'in readiness to take the field'. The Jacobite Rising, known latterly as the 15 was about to break out. On 3rd Sep they were ordered to march to Stirling Camp in Scotland. At that time the regiment had 21 officers, 6 sergeants, 6 drummers and 166 other ranks. They came under the command of John Campbell, The Duke of Argyll, a general who did his best to prevent atrocities. The regiment served at home for 26 years, for most of that time under the colonelship of Lieut-General William Ker who commanded the regiment for 32 years. He died on 11th Aug 1741 and was succeeded by Sir John Cope. The War of the Austrian Succession had started and in 1742 the Queen's Own Regiment of Dragoons sailed to Ostend. They went into winter quarters until Feb 1743. The British Army of 16,000 was led by Lord Stair but he was superceded by King George II. The Pragmatic Army of British, Austrian and Hanoverian troops marched into a trap set by Marshal Noailles on the River Main. Of all the Dragoon regiments, the King's Own (3rd) saw the most action and suffered the most casualties. They were on the left flank exposed to French artillery fire while the Queen's Own (7th) were on the right of the line. The Royal Artillery managed to silence the French guns and heavy fighting took place involving infantry and cavalry. It wasn't until later that the cavalry came around to the left flank, the Blues, the Queen's Own and the Royals to charge into the melee. Eventually the French were driven back and suffered many casualties, especially as they tried to swim across the river. The Queen's Own Dragoons casualties were: 3 officers, one sergeant, 10 privates and 21 horses killed. Wounded were one officer, one quartermaster, two sergeants, 13 privates and 13 horses. A large force of French under Lowendahl were besieging Tournai, and the allied army of 53,000, now commanded by the Duke of Cumberland confronted Marshal de Saxe's 70,000 men at Fontenoy, 5 miles southeast of Tournai. Saxe had built great redoubts for his artillery and fortified trenches for his infantry. The British infantry advanced bravely against the enemy but were fired on from three sides, suffering heavy losses, and were eventually forced to retreat. The French also suffered great loss but were victorious in the end. The British cavalry covered the retreat, and in this the Queen's Own Dragoons played their part. The Blues and the Royal Dragoons suffered the most casualties amongst the cavalry. As for the Queen's Own, the horses took the brunt of the casualties with around 50 being killed and the same amount wounded. Cornet Potts was killed along with ten men. Lieutenant-Colonel Erskine and 3 officers were wounded as well as 2 quartermasters and 35 men. Tournai capitulated and Ostend fell into Saxe's hands at the end of 1745. After wintering in Flanders the regiment were ordered back to England which was still threatened by the Jacobites following the Rising of 1745. While the Queen's Own waited to embark they received news of the Jacobite defeat and they were re-routed back to the European war. They were re-inforced with more men and horses from home and moved towards Charleroi which was under threat. But first Charleroi surrendered and then Namur, after an eleven day siege. The Allies fell back to protect Liege and took up positions on the River Jaar. The Queen's Own and the Inniskilling Dragoons were between Voroux and Roucoux. The Allies were positioned badly and Saxe was able to turn their flanks and cause their infantry to retreat. As in the case of Fontenoy the cavalry were required to cover the retreat and charge against the attackers. Casualty figures are not available but the regiment brought great credit to themselves in this little known battle. Marshal de Saxe had gained the advantage by positioning his army on the Herdeeren heights just southwest of Maastricht. Cumberland's army took up position amongst the villages of Lauffeldt, Vlytingen and the Spaevens. The French concentrated their repeated attacks on Laffeldt until they gained a footing there. The British left wing were brought round to force them back but Saxe sent 4 infantry brigades to counter this. The British infantry were hit hard and found themselves in disorder, so the Dutch cavalry were ordered to charge, but when they saw the French cavalry coming towards them they turned and fled, scattering allied infantry as they went. The French took advantage of this and pushed forward, causing the allies to retreat. General Ligonier then took charge of the British dragoons and charged the French cavalry who were in pursuit of the fleeing infantry. The Scots Greys, the 4th, Rothe's and the Queen's Own Dragoons charged together in this action. Ligonier placed himself at their head and they were able to halt the French cavalry and save the retreating allies, so allowing them to cross the Meuse on pontoon bridges. 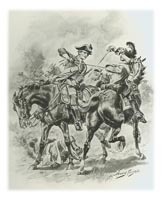 Five enemy standards were captured, but Ligonier lost his horse and was captured himself. Of the Queen's Own five men were captured along with Cornet Bulmore. Eight men were wounded. The regiment remained in Flanders until the Treaty of Aix-la-Chapelle in Oct 1748. On 29th Jan 1756 an important addition was made to the strength of the regiment in the form of a Light Troop. This was raised by royal warrant and consisted of 1 captain, 1 cornet, 1 quartermaster, 2 sergeants, 3 corporals, 2 drummers and 60 light dragoons. The strength of this unit was later raised to 100 (officers and men). The captain was William Erskine. The Troop was sent to camp at Petersfield on 13th May 1758 and on the 20th were told to prepare for embarkation at Portsmouth. They sailed for France to join an expeditionary force in June but In September they returned to England. That must have been a rehearsal for the two abortive raids on the French coast in the summer of 1760, in which the Light Troop took part while the rest of the regiment fought in Germany. After the Seven Years War, on 14th Jan 1763 the Troop was ordered to be reduced to 60 privates, and on 25th March 1763 it was disbanded. There were two expeditions sent across the English Channel to raid the north coast of France during the Seven Years War. The purpose of these raids was to draw French troops away from Germany and North America, and to cause damage to France. The force consisted of 13 battalions of infantry, 3 companies of artillery, a siege-train and a composite force of cavalry under Major-General George Augustus Eliott, who had raised the 15th Light Dragoons. This cavalry was made up of the Light Troops from 9 dragoon regiments, including the 7th. The entire force numbered 13,000 men and was commanded by Charles the 3rd Duke of Marlborough. They landed at Cancalle Bay near St Malo with the intention of besieging the town and fortress but the St Malo defenses were too strong and the idea was abandoned. They did, however, manage to burn several warships in the harbour. The troops spent another two weeks in the Channel and finally arrived back at St Helens at the end of June. The second raid left England on 1st Aug and was commanded by Lieut-General Bligh and first attacked Cherbourg with a naval bombardment from Commodore Howe's ships on 6th Aug 1760. They then landed at St Marais and marched to Cherbourg which immediately surrendered on the 8th Aug. The forts of Querqueville, Homet and St Galette were occupied and the harbour destroyed along with stores, guns, magazines and ships. Two brass mortars and 22 brass cannons were captured and sent back to England. The rest of the raid was fraught with problems. The troops re-embarked and sailed to St Luniere, 12 miles east of St Malo. They landed there on the 4th and 5th Sept to attack Morlaix. Having accomplished this they again sought to besiege St Malo and again decided not to. Meanwhile the fleet was forced to sail on to St Cas to receive the men for embarkation. This was partially achieved on 11th Sep but the approaching French army managed to catch up with them before the rear-guard of grenadiers had reached the boats. About 700 British troops were killed, drowned or taken prisoner. The British force arrived back in England on 18th Sept. The battle honour WARBURG was awarded to the 7th Hussars in 1909, this was 149 years after the event, longer than the award of DETTINGEN of 1882, only 139 years late. Warburg, fought on 31st July 1760, was a total and unquestionable victory for Britain and her allies over the French who had been our enemies throughout the 18th century. It is mostly famous for the charge of the British cavalry under the leadership of the Marquess of Granby who galloped bald-headed at the front of the first line consisting of the Blues and the 1st, 2nd, 3rd, 6th and 7th Dragoon Guards, and the second line made up of the 2nd, 6th, 10th and 11th Dragoons. The 7th Queen's Own and the 1st Dragoons were part of the two columns sent to occupy high ground at the rear of the French left wing. The hill was first gained by a small detachment of grenadiers but was under great pressure until the two dragoon regiments made a charge which resulted in many French casualties and prisoners, and the saving of the grenadiers. The London Gazette, at the time, published the casualty figures of the 7th Dragoons as: 'Killed, none - Wounded, none. One private and 4 horses missing.' Four men of the regiment were captured by the French but 3 of them escaped. No battle honour was awarded to any of the regiments that fought at the battle of Vellinghausen in 1761 even though it was another victory for the allied army under Prince Ferdinand of Brunswick. The 7th Dragoons, having wintered at Paderborn, marched west on 21st June 1761. They were brigaded with the Scots Greys and he 11th Dragoons. After much movement and re-positioning of the armies , the French, under marshal de Broglie, and the allies faced each other across the Rivers Aise and Salzbach, tributaries of the Lippe, around the villages of Kirchdenkern and Vellinghausen. The 7th QO were positioned, with their brigade, between the two villages and faced the main thrust of the French advance. They were heavily engaged and, according to a French account of the action, 'fought with indescribable bravery'. There are no casualty figures for the regiment but the allies lost around 1600 killed, wounded and missing against the French 7,000. The regiment had spent the winter in East Friesland and were now brigaded with the 11th Dragoons under the command of the 7th's CO Lieut-Col George Lawson Hall. Their strength in 1762 totalled 382, consisting of 28 officers and warrant officers, 24 NCOs, 243 men fit for duty and 16 sick. The remainder was made up of 47 'Wanting to complete' and 24 'Contingent Men'. The French commander de Broglie had fallen out of favour with his King and they were now under Soubise who was far less capable. The brigade left their camp and crossed the Dymel at daybreak on 24th June 1762. They attacked the French camp at Groebenstein and caused them to retreat to Cassel, without incurring any loss to themselves. The rest of the battle was conducted by Granby who commanded a column that made contact with the enemy before the arrival of Ferdinand. When the 7th Queen's Own Dragoons returned to England in March 1763 they were at first quartered in Essex. As usual in peacetime the strength of the regiment was reduced, to 6 Troops, each one consisting of 20 dragoons and 8 light dragoons, commanded by 1 captain, 1 lieut, 1 cornet, 1 quartermaster, 2 sergeants and 2 corporals. Since the disbandment of the Light Troop the men had been dispersed to each of the 6 Troops, remaining as part of the regiment until 1779. In that year they were transferred to a newly raised regiment, the 21st Light Dragoons. This new regiment only lasted a few years, being disbanded in 1783. It is likely that the men who came from the 7th were returned there because in 1784 the 7th Dragoons were converted to become the 7th Queen's Own Light Dragoons.